Barabara's all-natural and organic cereals and snacks not only taste great, but are made from only the finest ingredients found in nature. 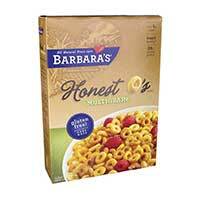 For nearly four decades, Barbara's has never used hydrogenated oils,refined white sugar, artificial colors, flavors or preservatives in out products. Just healthful, delicious, satisfying foods the while family will love.